I didn’t want to compress the ribs, for comfortable wear, but still give it a good waist reduction while keeping the pattern masculine looking. 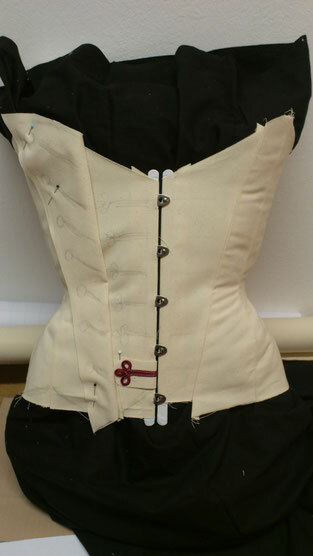 Pattern making for this corset was not as easy as I would have liked it to be. My muse Bob has a very small hip and quite a large ribcage. The first and second drawing went right into the bin. Next I tried Mr. Canney’s tutorial, but messed up halfway through. The actual pattern now is based on the look of Mr. Canney’s pattern but with considerable alterations. Three mock ups later I was satisfied with the fit. The big part done, I could finally start working. 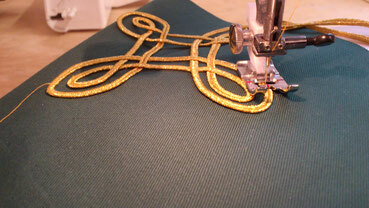 I love this part, when you just have to sew and watch how a design takes shape and comes to life. 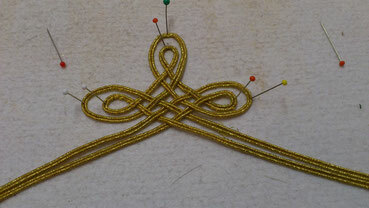 It took quite some time however to figure out how to get the golden soutache braid into the shapes I wanted. Once I got the hang of it was fun. 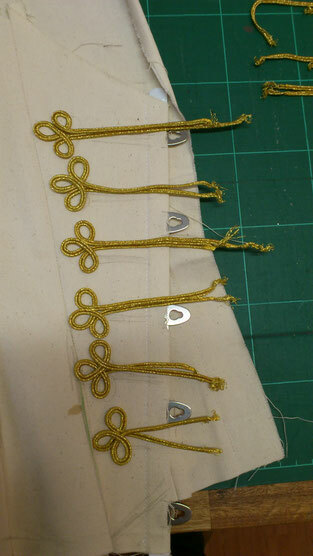 They were sewn onto the front panels and lapels by machine, carefully twisting and turning, but this was still much faster and more enjoyable than sewing by hand. 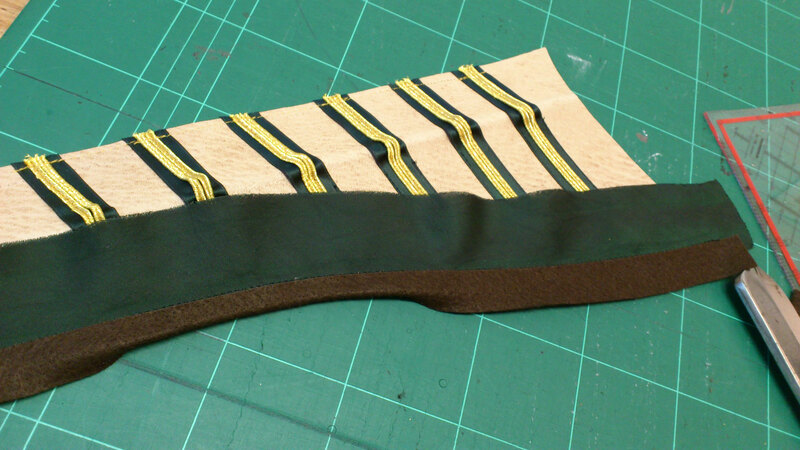 All pattern pieces were cut from herringbone coutil, without seam allowances, to avoid the turn of cloth issue. They were fused with a double sided glue web and ironed onto the backside of the fur before cutting. Sewing the prepared pieces together, it turned out, the sheep fleece wasn’t behaving so badly. I had expected a much more velvet like behavior concerning the pushing effect while sewing. Ironing worked quite well, so the seams were ironed open and felled flat. 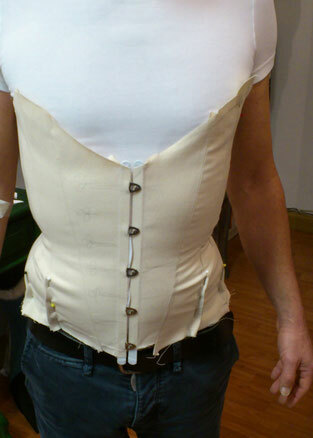 Next the waist tape was glued into place and boning channels were added. I also added two external boning channels per side. To enhance the hip curve they were made of the contrasting beige leather. There are nine spiral steels per side, two 5mm ones for the outer channels all the rest are 7mm wide. One flat steel at the front to have more control in the tummy area, and two as usual in the center back. The lapels were not boned but a little millinery wire helped to keep the upper flap in shape. 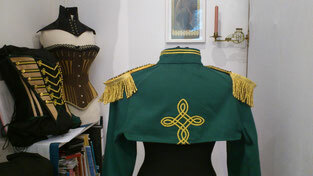 The under folded part of the lapels was fixed to the corset with only a few stitches to keep the attached look they have at historic uniforms. 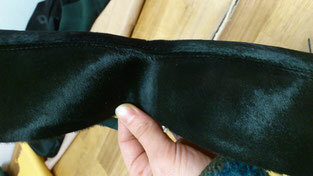 For comfortable wear I put in a floating cotton satin lining in black and fashioned a stiffened, floating back panel. 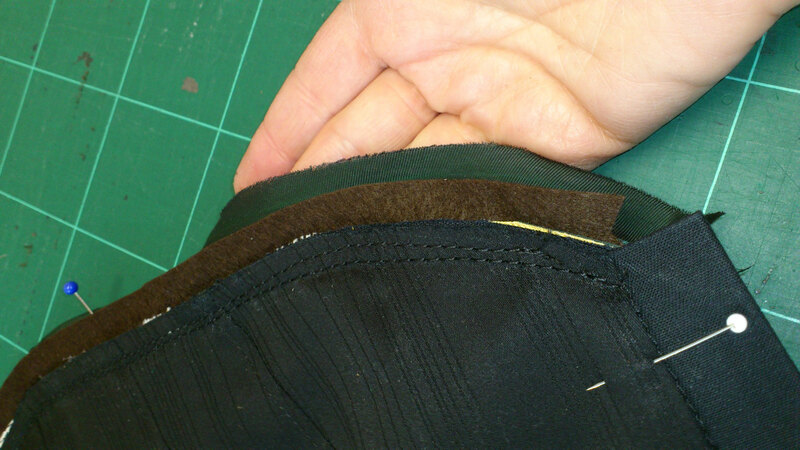 For the third time I tried to make a perfect hidden busk, but when the corset is laced you can always see a little bit of it. 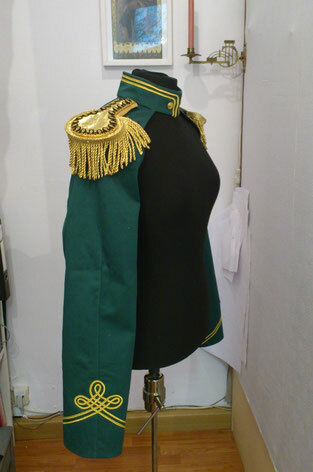 I remedied this with some black Velcro fastener between bust and fashion layer. 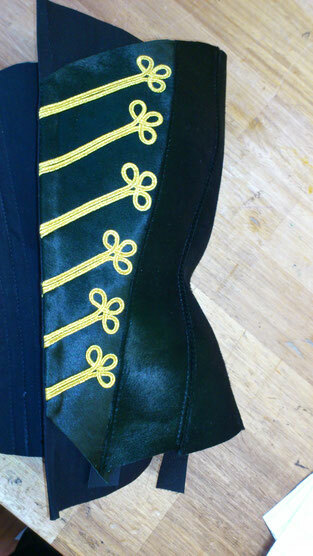 Of course there was no matching satin for binding so back to fiddling with dye. After the binding was sewn to the front, I glued a strip of felt to the edge to make the finished binding look more three dimensional. 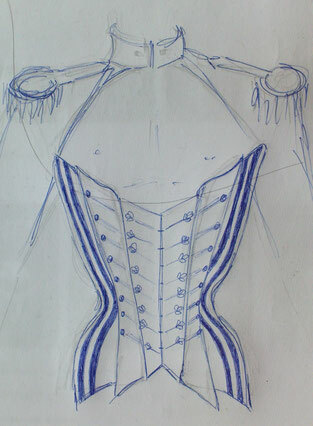 My original design had a bolero jacket with soutache ornaments and epaulettes to complement the look. It turned out really nice but wasn’t used a lot during the photo shoot. 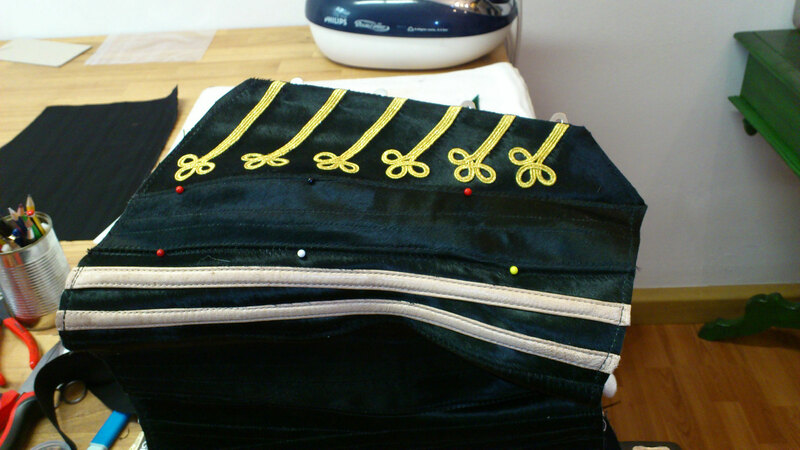 Instead we taped the epaulettes directly to Bob shoulders. I also hand crafted a giant walnut with papier-mâché on a balloon. Sadly it turned out to be a bit too big for the pictures. 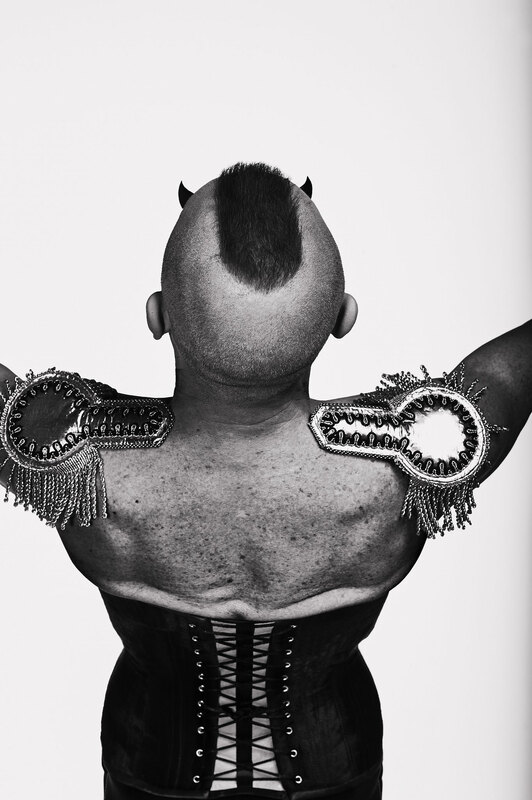 Seeing the corset on my model Bob, I have to admit I’m very happy with the way it turned out. I love the fit and the way the hip curve is showing, there is no wrinkling and the fur looks gorgeous. There’s nothing I would want to change. And, hey, how often does this happen?